Research infographic depicting donors by state for the Florida gubernatorial primaries. 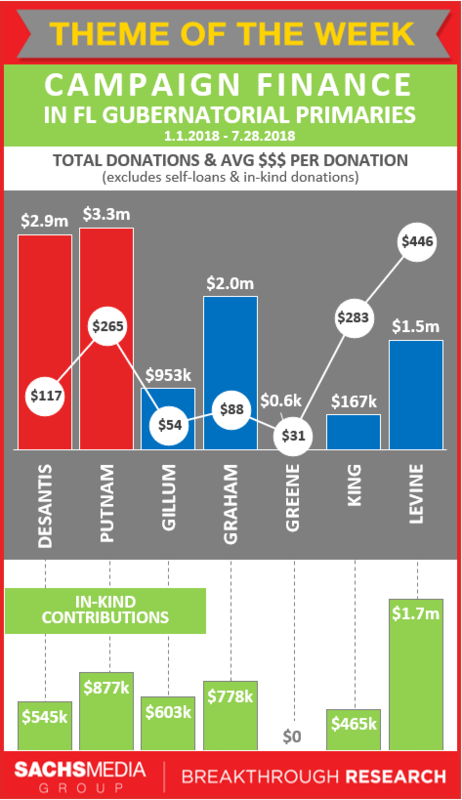 The bar graph describes donations from Florida, excluding self-loans and in-kind donations, categorized by candidate. 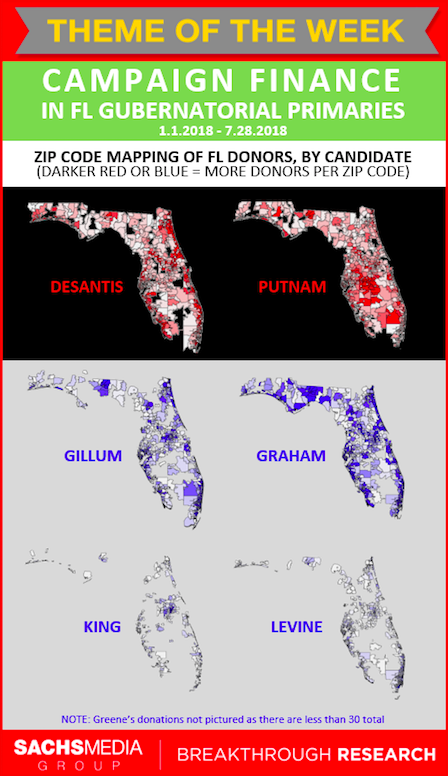 Research infographic depicting zip code mapping of Florida donors for the Florida gubernatorial primaries categorized by political affiliation and candidate. 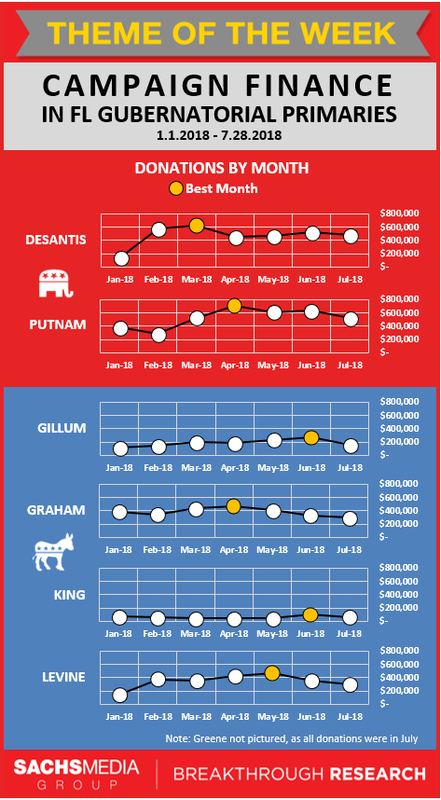 Research infographic describing the number of monthly donations for the Florida gubernatorial primaries categorized by political affiliation. Each line graph depicts the month with the highest number of donations for each candidate. 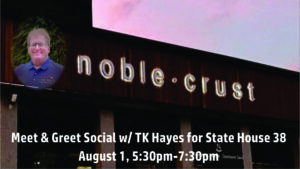 David TK Hayes, local Zephyrhills resident and businessman is running for Florida State Representative in District 38 in the general election, on November 6th, 2018. Representative Matt Caldwell continues to outraise the field and build momentum in his bid for Commissioner of Agriculture. In January, Caldwell’s campaign and Political Committee raised a combined $106,100. After tallying another strong month of fundraising, the campaign and Political Committee has raised more than $1.71 million in his bid for Florida Commissioner of Agriculture and has over $1.11 million cash-on-hand. Caldwell is running against Senator Denise Grimsley and former Representative Baxter Troutman in the Republican Primary. Senator Denise Grimsley, on the other hand, didn’t break the six-figure mark with her fundraising this month. In January, Grimsley’s campaign and Political Committee raised a combined $86,440 and has $909,459.75 cash-on-hand. Troutman also missed the six-figure threshold and, in January, his campaign and Political Committee raised a combined $79,500. The Commissioner of Agriculture serves as a member of the Florida Cabinet and is critical to the foundation of Florida’s economy. The Florida Department of Agriculture and Consumer Services helps the agricultural industry with its daily challenges, promotes Florida’s agricultural commodities, manages state forests, safeguards consumers, implements the school lunch program, and oversees the concealed-weapon license system. The campaign has announced the endorsements of: Republican House members from the Panhandle, Northeast Florida, Tampa Bay Region, Central Florida, Southwest Florida, and South Florida delegations. This is in addition to endorsements from the Associated Builders and Contractors of Florida, U.S. Rep. Matt Gaetz, former candidate for Commissioner of Agriculture Paul Paulson, and numerous county constitutional officers; including the statewide association Presidents of the Sheriff, Tax Collector, Property Appraiser, and Clerks for all 67 counties. The campaign continues to travel across the Sunshine State as a part of Caldwell’s statewide #2LaneTravels Work Days Tour that highlights and showcases industries overseen as Commissioner of Agriculture. WATCH: Highlights from our #2LaneTravels Work Days, including oysters, timber, cattle, and more! The Florida Chapter of American College of Surgeons (FCACS) is bringing a hands-on training session to the Florida Capitol this Wednesday, January 31st, to instruct the public on how to react in trauma situations. FCACS offers this training to legislators and the public as part of its annual Legislative Advocacy Days. Visit bleedingcontrol.org for more information. The Florida Chapter, American College of Surgeons offer a professional home for Florida surgeons who are interested in protecting our profession and patients. The Florida Chapter proudly provides avenues for continuing education in all surgical fields, practice enhancement and networking opportunities, and the development of personal relationships of the highest quality not available through other organizations. For more information, please visit the Florida Chapter website at floridafacs.org. The Mast for Congress campaign today released the first ad of the 2018 campaign cycle, titled “Promises Kept.” The 30-second spot highlights three bipartisan legislative achievements that fulfill major campaign promises: protecting seniors from fraud, preventing critical veterans programs from expiring and passing new funding to combat harmful algal blooms. Additionally, after raising $419,000 during Q4 of 2017, the Mast For Congress campaign now has $1,039,000 cash on hand. When I became your Congressman, my promises became my mission. To protect seniors, I passed legislation to crack down on crimes which target seniors and strengthen Medicare. For our veterans, my bill averted crisis by protecting veterans healthcare programs. And for our environment, I secured more than $20 million to combat harmful algal blooms in our waterways. I know my mission is not over. That’s why I’m asking for your support to stay in the fight. I’m Brian Mast and I approve this message. The Elder Abuse Prevention and Prosecution Act promotes the investigation and prosecution of criminals who prey upon seniors, enhances data collection on crimes targeting seniors and provides additional resources for elder abuse prevention programs. The bipartisan bill passed the House of Representatives on October 3, 2017, with Congressman Mast’s support, and was signed into law on October 18, 2017. The Protecting Seniors Access to Medicare Act strengthens Medicare by eliminating the unaccountable and unelected Independent Payment Advisory Board. The bill passed the House of Representatives, with Congressman Mast’s support, on November 2, 2017. Medicare Part B Improvement Act helps ensure there aren’t gaps in coverage for Medicare beneficiaries and helps patients with chronic diseases more easily access their treatments. The bipartisan bill passed the House of Representatives, with Congressman Mast’s support, on July 25, 2017. Congressman Mast introduced the Department of Veterans Affairs Expiring Authorities Act of 2017. The bill extended a number of expiring programs impacting veterans healthcare and benefits, including homeless programs, nursing home care, child care assistance and home loan services. The bill passed the House on September 25, 2017 and the Senate on September 27, 2017 with bipartisan support. The Department of Veterans Affairs Expiring Authorities Act of 2017 was signed into law by the President on September 29, 2017. $8 million to the National Oceanic and Atmospheric Administration to combat harmful algal blooms. Introduced with Congressman Vern Buchanan (FL-16). $5.6 million for the Natural Resource Conservation Service to promote environmentally sustainable toxic runoff mitigation. $2 million for the Agriculture and Food Service Initiative to expand research into prevention of harmful algal blooms. $1.5 million for the Food and Drug Administration to research the health impact of contaminated seafood. $1.1 million for the Environmental Protection Agency to research the impact on water quality of nutrient inputs. $1 million for non-point source pollution mitigation grants, including removal of toxic substances. $1 million for the U.S. Geological Service to research harmful algal blooms. $1 million for the National Institute of Environmental Health Sciences to study the health impacts of exposure to harmful algal blooms. $598,000 for the Department of the Navy to fund the Environmental Sustainability Development Project research on coastal contamination. $500,000 for the Aquatic Plant Control Research Program to develop technology to combat harmful algal blooms. $400,000 to the Centers for Disease Control to investigate environmental threats of public exposure to waterborne contaminates. Florida Realtors, the state’s largest professional trade association, officially kicked off its campaign to pass Amendment 2, which gives voters the chance to make a 10 percent cap on annual non-homestead property tax increases permanent. It will appear on the 2018 general election ballot. Prior to the 10 percent cap, if the value of a business owner’s property increased significantly compared to the previous year, they could see their property tax bill skyrocket. Owners of investment homes also faced steep property tax hikes, which could be passed along to tenants in the form of higher rents. Florida Realtors, along with its coalition partners, is planning a comprehensive, direct-to-voter campaign over the next 14 months. The campaign theme, “Everybody is for Amendment 2, because Amendment 2 is for Everybody” signifies the importance the measure holds for every citizen of the state. The 10 percent cap on non-homestead properties was part of the Save Our Homes portability constitutional amendment voters approved in 2008. The 10 percent cap portion of the amendment sunsets on Jan. 1, 2019. The kick-off includes the launch of the campaign’s website, www.EverybodyIsFor2.com which features a video outlining the benefits of the amendment.